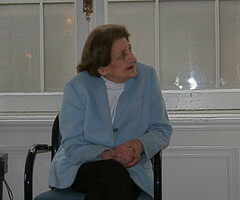 With a career in the White House dating back to President Eisenhower Kennedy, Helen Thomas has been considered the grand old dame of the White House Press Corps for many years. After some remarks that came out Friday, though, she has announced her retirement this afternoon, effective immediately. While I’m not sure I can weigh in effectively on the content of her remarks, they have certainly generated a lot of left/right commentary in the last few days that made her in front of the story than behind the story. Not ones to miss the opportunity for a good joke, the Washington DC JCC tweeted that Thomas was going on to serve as Mel Gibson’s publicist. her first president was kennedy. get your facts straight. Sorry, Paula, I was going by the report in FT which mentioned Eisenhower. I will correct this shortly, honest mistake.